The FY19 funding forecast looks bright for the National Endowment for the Arts (NEA). Despite an attempt to cut 15% from the budgets of the NEA and National Endowment for the Humanities, bipartisan support in the House of Representatives prevailed in the completion of the Interior funding bill, which included a $2 million increase for each agency, to a level of $155 million. The Senate Appropriations Committee has passed a recommendation for the same amount, with the full chamber expected to take action soon. Washington, D.C. - Thanks to advocates speaking up across the country and continued strong bipartisan support in Congress, yesterday afternoon the House of Representatives voted 114 to 297 against an amendment offered by Rep. Glenn Grothman (R-WI-6) to decrease funding for the National Endowment for the Arts (NEA) and the National Endowment for the Humanities (NEH). Please see the League's voting record to find out how your Representative voted and take a moment to send a follow-up note, which we've prepared for you according to your Representative's vote. Congressional Caucus Co-Chair Leonard Lance (R-NJ-7), pointed out that for "every dollar the United States spends on Federal arts initiatives, nine non-Federal dollars are leveraged, generating roughly $600 million in matching funds." The League's written testimony to the House Interior Appropriations Subcommittee earlier this year highlights the unique impact of the NEA's investment in the work of orchestra grantees. Thanks to your crucial voice as constituents, Congress continues to restore the federal investment in arts and culture, as the House moves forward a $2 million increase for FY19. The Senate votes on funding as early as next week. If you have not yet reached out to your Senators, you can easily and quickly do so via our online campaign. Washington, D.C. - Please ACT NOW to urge your member of the U.S. House of Representatives to support full funding for the National Endowment for the Arts (NEA) and National Endowment for the Humanities (NEH) for the upcoming FY19 fiscal year. Louisiana Philharmonic Orchestra ($27,000) to support Soul Strings, a music-informed therapy program hosted collaboratively with the Arc of Greater New Orleans. The Philadelphia Orchestra ($76,000) to support a music therapy program for Philadelphia's homeless population in partnership with Broad Street Ministry. South Dakota Symphony Orchestra ($18,000) to support Music as Medicine, a partnership with Sanford Health and Avera Health that will offer live music as a form of therapy. The League's customized tips are available for orchestras interested in applying for NEA support. Please also note that the System for Award Management (SAM.gov) has implemented new requirements to address security concerns which may affect your ability to apply to or receive an award or any payments from the National Endowment for the Arts or any other federal agency. If you are registering a new entity in SAM.gov, or updating or renewing your SAM.gov registration, you must provide an original, signed notarized letter stating that you are the authorized Entity Administrator before your registration will be activated, updated, or renewed. Read the FAQs on SAM.gov to learn more about this process change, which was put into effect over the last 2 months. Earlier today, the Trump Administration released its budget proposal for fiscal year 2019. Like its FY18 proposal, several agencies and programs important to the arts community are targeted for elimination, including the National Endowment for the Arts (NEA), National Endowment for the Humanities (NEH), the Corporation for Public Broadcasting (CPB), the Institute of Museum and Library Services, and several programs at the U.S. Department of Education such as the Arts in Education program, 21st Century Community Learning Centers, and Well-Rounded Education support grants. While the Bureau of Educational and Cultural Affairs at the U.S. Department of State does not face elimination, its proposed allocation of $159 million falls far short of its current estimated level of $630 million. Bipartisan support in Congress was absolutely critical in ensuring the arts not only maintained safe footing in FY17 appropriations but even resulted in an increase of $2 million to each agency for total funding of $150 million each. Although the FY18 budget has not yet been resolved, the House Appropriations Committee approved $145 million for the NEA last July, while the Senate Appropriations Committee proposed $150 million this past November. We need you to keep speaking up! The President's budget proposal is just the first step in the FY19 funding process, and Congress will take up spending decisions over the months ahead. There are many opportunities to engage with policy makers, and the League maintains a very quick and easy online platform to send emails to Congress that we encourage you to personalize. Even more effective is interacting with your elected officials when they are in their home district or state. Lastly, we know some people think they are not allowed to lobby when it comes to federal policy and funding, but you absolutely can -- and should -- be playing your part as an arts advocate! No matter what action you take, please keep the League's policy team informed so we can support what you're doing and let you know what we hear from specific offices as well. Orchestras will present concerts, provide instrumental music instruction to young students, commission new works, and engage in community partnership programs this year with the support of 52 Art Works (Part 1) and Challenge America grants awarded by the National Endowment for the Arts (NEA). Direct grants from the NEA are a critical form of support for community-based arts organizations, not only in recognizing artistic excellence, but as a means of leveraging additional financial support from state, local, and private sources that value the rigorous and competitive NEA grant process. Thirty-nine Art Works grants totaling $1,215,000 have been awarded to orchestra projects directly, which will create and present new and existing work, support lifelong learning in the arts, and increase public access to and engagement with live orchestral experiences. In addition to these direct grants, numerous grants have been awarded for related orchestral projects, music festivals, and training programs. The NEA also awarded $130,000 in FY18 Challenge America support to thirteen orchestras extending the reach of their orchestral music, educational programming, and community engagement activities to youth and adults whose access to the arts are otherwise limited due to geography, economics, or disability. Mark your calendar with the following deadlines for NEA FY19 Grants for Arts Projects, the Endowment's major support category for organizations for projects anticipated to take place beginning in 2018. Yesterday, the U.S. Senate Appropriations Committee proposed funding the National Endowment for the Arts (NEA) at $150 million in FY18, which is its current funding level. While the Trump Administration's budget had proposed eliminating the NEA, the House Appropriations committee approved $145 million over the summer, and now with the Senate committee’s proposal released, the next steps are for the full chambers to pass their own respective budget proposals before coming to an agreement that reconciles their differences. Orchestras in the states of Senate Appropriations committee members have been speaking up over the fall – in addition to orchestras and arts supporters weighing in with all of their members throughout the year. We thank everyone for tirelessly reminding elected officials how essential federal support for the arts is in communities large and small. Please see our online campaign for key talking points. October 1 marked the beginning of the new federal fiscal year, accelerating action in Congress on tax reform and FY18 spending decisions. Orchestras are taking action to speak up in support of protecting charitable giving incentives and continued funding for the National Endowment for the Arts. A budget resolution making its way through Congress now may enable the Senate to pass a tax reform package with a simple majority vote in the months to come. And, Congress has until December 8 to settle next steps on funding the federal government. The next two weeks include a House and Senate break, so check out our Congressional Recess Schedule to find out when you can meet with your members of Congress in their home districts and states. While the Trump Administration's FY18 budget proposes eliminating the NEA, this summer the House Appropriations committee approved $145 million for the current fiscal year, a $5 million reduction in funding. Senate Appropriations committee consideration is up next, and your help is needed as constituents who matter to these important decision makers. Because the House and Senate often settle on an appropriations level somewhere between their respective recommendations, it is crucial that the Senate support as high a number as possible. $150 million would be level funding for the NEA, and anything above that amount would be a strong sign of support not only for the agency's continuation but its growth. Orchestras in the states of Senate Appropriations committee members are already speaking up, and contacts to the full Senate are always helpful. Please see our online campaign for key talking points. Arts funding made further progress in Congress when on Tuesday, July 18 the House Appropriations Committee approved the Interior Subcommittee's recommendation of $145 million each for the National Endowment for the Arts (NEA) and National Endowment for the Humanities (NEH). Although the typical order calls for the full House to next take up the funding recommendation in a floor vote, timing is uncertain as Congress considers bundling together spending bills into one or more FY18 funding packages. If you have not yet contacted your members of Congress to urge support for FY18 NEA funding, please check out the League's easy-to-use online campaign. First step: NEA funding approved by House subcommittee! Yesterday, the House Interior Appropriations Subcommittee took the first Congressional action in response to the President's call to eliminate the National Endowment for the Arts (NEA) and National Endowment for the Humanities (NEH), and recommended $145 million in FY18 funding each for the NEA and the NEH. This is a strong indication of continued bipartisan support for the cultural agencies on the Hill. While the Trump Administration's FY18 budget proposed eliminating the NEA in the next fiscal year beginning October 1, 2017, funding leaders in Congress swiftly went on record in support of continued funding, and 154 member of the House asked appropriators to increase NEA funding by $5 million to a total of $155 million. With a 2.5% reduction in total funding available for the Interior bill, the subcommittee yesterday recommended a $5 million reduction for the NEA, 3.3% of the agency's current budget. Thank you for your ongoing advocacy over the past several months. The bill may be considered by the full House Appropriations Committee as early as next week, with Senate action to follow, so ongoing participation is essential as advocates continue to make the case for $155 million in funding each for the NEA and NEH. Please see the League's online campaign for key talking points. As the League has reported, Congressional leaders have been voicing bipartisan support for the NEA, not only in public statements made in recent months, but over the past two years of funding proposals. The Administration says it is proposing shutting the NEA down, "given the notable funding support provided by private and other public sources and because the Administration does not consider NEA activities to be core Federal responsibilities." However, earlier this month, Congress affirmed the unique value of federal support for the arts, approving a $2 million increase in funding for the NEA in FY17 and specifying that priority be given to, "providing services and grant funding for projects, productions, or programs that encourage public knowledge, education, understanding, and appreciation of the arts." Orchestras interested in applying for the second round of Art Works grant funding for FY18 should take note of the July 13 deadline. The League offers guidance specific to orchestras on our Tips for Your Application page in addition to the complete guidelines posted by the NEA online. Earlier this morning, President Trump released his budget outline for fiscal year 2018, including a call for the elimination of the National Endowment for the Arts (NEA), National Endowment for the Humanities (NEH), the Institute of Museum and Library Services (IMLS), and the Corporation for Public Broadcasting (CPB), along with deep cuts to afterschool funding and State Department cultural exchange programs -- all as part of a broader effort to decrease nondefense domestic discretionary spending by $54 billion. In a public statement this morning, NEA Chair Jane Chu said, "We understand that the President's budget request is a first step in a very long budget process ... At this time, the NEA continues to operate as usual and will do so until a new budget is enacted by Congress." From creating educational collaborations with the Anchorage Public Schools, making new music that honors the sounds of the traditional Lakota drums in South Dakota, to preparing the next generation of professional musicians in Miami, orchestras across the country form partnerships that strengthen the fabric of their communities with the support of NEA funding. This week marked the first wave of action in Washington, D.C. on future funding for the National Endowment for the Arts (NEA). Amidst the new Administration's proposal to deeply cut non-defense spending, leaders in Congress are already signaling that they will take a different path as they set FY18 funding levels. Read on for details and actions to take. On Monday, February 27, an initial outline of President Trump's FY18 budget was announced, with the promise to send Congress a more detailed budget on March 16, and a final full proposal in May. The President is proposing a $54 billion increase in defense spending, while recommending cutting that same amount from nondefense discretionary spending. While these topline budget numbers were announced, the plan did not specify a request related to NEA funding. Rep. Mike Simpson (R-ID02), a senior member of the House Appropriations Committee with a record of supporting funding for the National Endowment for the Arts (NEA) and National Endowment for the Humanities (NEH), has voiced skepticism about such drastic cuts to nondefense spending. Rep. Simpson was quoted by Congressional Quarterly as saying, "I don't think you could pass any of the bills... There's a lot of members that have a lot of interest in a lot of these programs. There's more to our government than just defense." While the President's ultimate budget request will influence the debate on the Hill, the funding levels for each federal agency will ultimately be set by Congress before final spending bills are passed and handed back to the President for his signature. Congressional action on FY18 funding levels for the NEA began on February 28 as the House Interior Appropriations Subcommittee heard testimony from members of Congress regarding programs funded through the Interior Appropriations bill, which covers a broad territory, from sage grouse conservation to wildfire suppression. Given the wide variety of issues at hand, it is significant that 5 of the 19 members testifying -- including Rep. Louise Slaughter (D-NY25), who co-chairs the Congressional Arts Caucus, Rep. David Price (D-NC04), Rep. Brian Higgins (D-NY26), Rep. Sheila Jackson-Lee (D-TX18), and Rep. Alma Adams (D-NC12) -- spoke up in support of the NEA and NEH, praising both agencies' impact in communities across the country, and the NEA's Healing Arts program for wounded veterans. Arts Caucus co-chair Leonard Lance (R-NJ-07) submitted a statement for the record in support of the NEA and NEH, saying, "Art is now, has been, and will always be a part of our Nation's fabric." Rep. Price urged the subcommittee to consider the nationwide impact of the cultural agencies, to which Chairman Ken Calvert (R-CA42) responded, "As you know, there's always been bipartisan support for the se programs and I suspect that will be in the future, too." 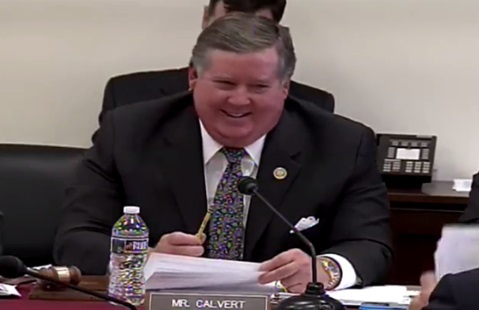 Under Chairman Calvert's leadership last year, the Interior Appropriations Committee approved a $2 million increase in funding for the NEA. Home Meetings: See our calendar of opportunities for when to meet your members of Congress in their home districts and states, and invite them to see your orchestra's value to your community first-hand. Speak Up and Stay Tuned: The League has an open online campaign on NEA funding. We will notify you with action alerts that let you know of pivotal moments to make your voice heard. In the meantime, please use the key messages and background to inform your ongoing conversations with your elected officials. The most effective advocacy is personalized and happens long before a vote is taken. Plan for Arts Advocacy Day: Our advocacy strategies are shaped in close partnership with the broader national arts and nonprofit communities. The League is once again serving as a national partner of National Arts Advocacy Day, which will take place this year on March 21, 2017. The League helps to craft the policy briefs on a wide range of issues, and our D.C. staff has a direct hand in training the hundreds of advocates that will visit their elected officials on Capitol Hill. We've penned a letter to Congress summarizing our key policy asks, and we'll be sending you an alert about how you can join in Arts Advocacy Day from home. NEA Funding: While a single, much-publicized news report in January suggested that the future of direct federal support for the arts is threatened with elimination under the new Administration, President Trump has not yet put forward a recommendation for funding levels for the National Endowment for the Arts (NEA) and National Endowment for the Humanities (NEH). He has placed two transition team members within the NEA, and the agency is currently funded at $148 million. Under the ongoing leadership of Chairman Jane Chu, the NEA continues to deliver direct grants, national research, and support to state arts agencies. Both the NEA and NEH have consistently received bipartisan support from funding leaders in both the House and Senate in recent years. Proof of that support continued this week in a letter from 24 Senators to President Trump, requesting support for "these fundamental American institutions" as the President continues to shape the FY18 budget request he will submit to Congress in the coming weeks or months. Next steps are expected in the House, as the funding committee begins hearings on the Interior Appropriations bill on February 28. Future FY17 grants will be announced for Art Works (Part Two) in the spring. Deadlinesfor FY18 grant applications have been posted, and guidelines are expected in mid-late December. As part of the NEA Chairman's 50th anniversary Creativity Connects initiative, Creativity Connects: Trends and Conditions Affecting U.S. Artists was produced in cooperation with the Center for Cultural Innovation. It examines issues such as funding and training, but also widens the lens to look at the effect of other forces shaping the work environment for artists including technology, the gig economy, student debt, and the growth of cross-disciplinary work. Accompanying the report is a new interactive graphic on the NEA's website, called Bright Spots. This graphic features resources and successful projects undertaken by partnerships of arts and non-arts organizations that demonstrate new ways in which creative people are working. Track One: Value and Impact research projects aim to examine the value and/or impact of the arts in any topic area(s) by using data and methods appropriate to the proposed research questions. Matching grants range from $10,000-$30,000. Track Two: Experimental and Quasi-Experimental Designs research projects aim to test the causal or inferred-causal impact of the arts on individual or cohort outcomes by using experimental or quasi-experimental design methods appropriate to the proposed research questions. Matching grants range from $30,000-$100,000. The House Interior Subcommittee has approved a $2 million increase for the National Endowment for the Arts (NEA) in FY2017, matching the President's budget request. Today, the Senate Interior Subcommittee approved an increase of $500,000. Every dollar matters - and so does your voice - as both the House and Senate move the NEA's funding forward for further consideration. The full House Appropriations Committee acts tomorrow, and the Senate Appropriations Committee plans to take up the bill on Thursday. Now is the time for you, as a constituent of these key decision makers, to weigh in and remind your members of Congress just how important the NEA is in bringing the transformative power of the arts to all corners of the country. CONTACT CONGRESS TODAY: Join us in urging Appropriators to support increased funding for the NEA in FY17! This Wednesday, your member of Congress will be at the table when the House Interior Subcommittee considers a bill that includes the FY17 budget for the National Endowment for the Arts (NEA). The total amount of money that the Subcommittee can allocate to various accounts is subject to budget caps, which means all non-defense spending continues to be vulnerable to reductions. Grants awarded to orchestras by the NEA, and support provided to orchestras through NEA funds administered by state arts agencies, provide critical funding for projects that increase access to music in communities nationwide. Orchestras and the broader arts community are requesting $155 million for the NEA. Please use the League's online Advocacy Center to tell your Representative how vital NEA funding is to your community and to the nation. Your voice matters! Click Here to Contact Your Representative Today! Schools and communities throughout the nation will engage with orchestral music thanks in part to Art Works support from the National Endowment for the Arts (NEA). The NEA's second round of FY16 Art Works awards includes 51 direct grants to orchestras totaling $1,123,500, as well as numerous grants for related projects. Grantees will collaborate with music educators to encourage participation in school instrumental music programs, provide instruments and music instruction to students in economically distressed communities, offer side-by-side performance opportunities with adult amateurs and youth musicians, live stream concerts, expand online audio archives, commission new works, tour to rural communities, and present discounted or free concerts, festivals, master classes, workshops, and many more programs for people in a variety of circumstances and of different ages and experiences. In addition to providing direct funding, NEA awards, which require a minimum one-to-one match of federal funds, stimulate on average a return of at least nine dollars to one from other state, local, and private sources. The League submits written testimony to Congress in support of NEA funding every year, provides orchestras with customized tips for applying for an NEA grant, and compiles the project descriptions for grants awarded to orchestras and projects related to the orchestra field. Complete lists of grant amounts and project descriptions for awards in all disciplines may be found on the NEA website in a state-by-state listing or a discipline/field listing. In addition, the NEA maintains an online grant search system which allows members of the public to search all of the NEA's grants since 2000 using a variety of attributes to customize search results. The next deadline is July 14, 2016 for an FY17 Art Works, Part 2 grant. Orchestras interested in learning more about the process and to discuss their programs are invited to schedule a free one-on-one consultation with the NEA's music specialists at the League's Conference this June. Appointments must be made in advance by contacting the League's DC office. Before adjourning for the winter holiday, Congress approved a $2 million funding increase for the National Endowment for the Arts (NEA). For the NEA, this represents the agency's first increase since cuts to its budget in FY12. Orchestras interested in applying for the next round of NEA grant funding should review the League's Tips for Preparing Your FY17 NEA Grant Application, which highlights important changes to grant guidelines, shares advice from panelists and NEA staff, and notes the dates for FY17 application deadlines and helpful webinars. As part of its 50th anniversary initiative, this week the NEA announced Creativity Connects - a new pilot grant program that intends to show how the arts are central to the country's creativity ecosystem, investigate how support systems for the arts have changed, explore how the arts connect with other industries, and invest in innovative projects to spark new ideas for the arts field. Art Works: Creativity Connects grants will support partnerships between arts organizations and organizations from non-arts sectors that include business, education, environment, faith, finance, food, health, law, science, technology, and more. For eligible applicants, this new grant category may offer an "extra" opportunity of support from the NEA. An organization may submit an application to Art Works: Creativity Connects in addition to a grant application that has already been submitted for FY16, and is still eligible to submit an FY17 application to other NEA categories, including the other areas of Art Works and Challenge America. The application deadline is March 2, 2016, and funded projects would begin after January 1, 2017. The NEA provides a special FAQ page and offers registration for a guidelines workshop taking place in late January 2016. Be sure to note all NEA grant application deadlines, and stay tuned for updated tips for preparing your NEA grant application. Orchestras will serve their communities in the coming year with grant support from the National Endowment for the Arts (NEA) through 61 grants in the Art Works (Part 1) and Challenge America categories. In addition to providing direct funding, NEA awards stimulate on average a return of at least seven dollars from other state, local, and private sources. The NEA's first round of FY16 Art Works grants - which focus on the creation of work and presentation of both new and existing work, lifelong learning in the arts, and public engagement with the arts - includes 50 direct awards to orchestras totaling $1,567,000, as well as numerous grants for related projects. Several of the awards, such as those to Boulder Philharmonic and the St. Louis Symphony Orchestra, are for "Imagine Your Parks" projects in celebration of the NEA's 50th Anniversary and the centennial of the National Park Service. Orchestra grantees receiving Art Works support will present and offer premieres of new commissions, pre- and post-concert talks, master classes and workshops, instrument training programs for young musicians, countless school visits, and collaborations with fellow orchestras, local cultural organizations, and schools. The NEA also awarded $110,000 in FY16 Challenge America grants to 11 orchestras that will extend the reach of their music, educational programming, and lecture-demonstrations to youth and adults whose opportunities to experience the arts are limited by geography, economics, or disability. Supported projects include free concerts and festivals as well as programming for students in Title I and geographically isolated schools, seniors, and adults with disabilities. Future FY16 grants will be announced for Art Works (Part Two) in the spring. Deadlines for FY17 grant applications have been announced, and guidelines are expected in the coming weeks. The President's Committee on the Arts and the Humanities, in partnership with the National Endowment for the Arts, the National Endowment for the Humanities, and the Institute of Museum and Library Services, is now accepting applications for the 2016 National Arts and Humanities Youth Program Awards. With its $10,000 award for each of twelve winners, the National Arts and Humanities Youth Program assists organizations, furthers knowledge, and encourages development of future programs. After-school and out-of-school time arts and humanities programs sponsored by performing arts organizations, museums, libraries, educational institutions, arts centers, community service organizations, businesses, and eligible government entities are encouraged to submit an application. Be sure to review all of the program's Eligibility Criteria note that the deadline for application submissions is Tuesday, February 2, 2016, 5:00 p.m. PST. Initial rapid progress in Congress has now slowed as the FY16 Interior Appropriations bill, which funds the National Endowment for the Arts (NEA), gets caught up in broader partisan policy divides. Both the House and Senate committees passed their proposals, which call for continued funding of the NEA at $146 million. The House bill made its way through debate this week, before being abruptly pulled from the floor, while the Senate has not yet sent its bill to the floor for a full debate. Controversial policy provisions related to environmental policy, overall budget levels, and recent proposals related to display of the confederate flag have drawn objections from the White House and Congressional minority, miring the bill in partisan debates. Even if both chambers pass their versions, the ultimate state of Interior funding remains uncertain. Orchestras have been active participants during the FY16 budget process, beginning with in-person testimony before the House Interior Subcommittee in March, written testimony to the Senate submitted by the League in April, and continual advocacy from orchestras engaging throughout each stage of the funding process, reaching out to officials in 38 states and counting. Funding for the National Endowment for the Arts (NEA) may be up for consideration by the full U.S. House of Representatives as early as next week. Orchestras are contacting Congress as the House and Senate have been speedily determining spending priorities within the Interior Appropriations bill that funds the NEA. Bipartisan support for the NEA was evident in the spending levels approved this week by both the House and Senate Appropriations Committees, which each approved $146 million in level funding for the NEA, even as the committees wrestled with the limitations of spending caps and decreased spending in other areas. Unlike recent years in which the House Subcommittee approved cuts of up to 49% of the NEA's budget, level funding was fully preserved during committee consideration this week. Provisions to increase the NEA's budget by $2 million, as requested by President Obama, were offered by Rep. Steve Israel (D-NY) during House committee consideration on June 16, and by Sen. Tom Udall (D-NM) when the Senate committee met today, but did not receive approval by either committee. Broader budget stalemates have prevented individual spending bills from advancing to floor consideration in recent years, resulting in catch-all spending measures to keep the government in operation. This year the process takes on a new form, allowing more opportunities for funding to receive full consideration by all members of Congress. With one party controlling both the House and Senate, it is possible for bills to move through committee to floor consideration by each chamber, but the measures will face familiar barriers to completion as the White House and Congressional minority object to an array of controversial policy provisions. On the Senate side, Appropriations Committee members noted that this week is the first time an Interior funding bill has been passed by that committee since 2009. In the House, the last up-or-down vote related to NEA funding on the House floor took place in 2011. The House is likely to act soonest, with votes on the Interior bill possible as early as next week. The League advocates on behalf of orchestras in support of NEA funding throughout the year. In March, we joined with Opera America in presenting Melia Tourangeau, President & CEO of the Utah Symphony | Utah Opera, to offer testimony before the House Interior Subcommittee, and the next month, the League submitted its annual written testimony to the Senate, highlighting the work of orchestra grantees throughout the country. In advance of recent committee action, orchestras in the districts and states of House and Senate committee members have been telling their members of Congress how the NEA provides critical funding for projects that increase access to music in communities nationwide. Orchestra advocates can use the League's advocacy center to weigh in with Congress and describe how NEA funding supports arts education for children and adults, expands public access to performances, and nurtures the creative endeavors of artists throughout the country. The League will keep you informed of key advocacy opportunities as the timing for votes on NEA funding is confirmed! On Tuesday, June 16, the House Appropriations Committee will debate a bill that includes the FY16 budget for the National Endowment for the Arts (NEA). This step follows the House Interior Subcommittee's recommendation on June 10 of $146 million for the NEA. Your member of Congress serves on the House Appropriations Committee and will play a key role in determining this year's NEA funding level. The League advocates on behalf of orchestras in support of NEA funding throughout the year. In March, we joined with Opera America to bring Melia Tourangeau, President & CEO of the Utah Symphony | Utah Opera to testify before the House Interior Subcommittee, and the next month, the League submitted its annual written testimony to the Senate, highlighting the work of orchestra grantees throughout the country. Throughout the year, we encourage orchestra advocates to tell their members of Congress how the NEA provides critical funding for projects that increase access to music in communities nationwide. On Tuesday, June 16th, the Senate Interior Subcommittee will debate a bill that includes the FY16 budget for the National Endowment for the Arts (NEA). Your Senator serves on this committee, and will play a key role in determining this year's NEA funding level. The budget process began earlier this week with the House Interior Subcommittee recommending level funding of $146 million, and both chambers of Congress are expected to advance their respective bills quickly, so it is vital to weigh in now. The total pool of funds available for the Subcommittee to allocate to various accounts is subject to budget caps that make all non-defense spending vulnerable to reductions. Orchestras and the broader arts community are requesting an FY16 budget of $155 million for the NEA. There is a small window of time for Congress to pass its funding bills, and the Senate Subcommittee deliberation is an important opportunity to weigh in directly with the influential members who will set the tone for the NEA's FY16 budget allocation. Please use the League's online Advocacy Center to tell your Senator how important NEA funding is to your community and to the nation. Your voice matters! Click Here to Contact Your Senator Today! Communities throughout the nation will be engaging with orchestral music, supported by Art Works grants from the National Endowment for the Arts (NEA). The NEA’s second round of FY15 Art Works support includes 43 direct grants to orchestras totaling $1,062,500, as well as numerous grants for related projects. Grantees will offer training programs for student musicians and school teachers, free concerts, family programming, artist residencies, new commissions, premieres, national and regional tours, broadcasts and digital archiving, and collaborations with local organizations. In addition to providing direct funding, NEA awards, which require a minimum one-to-one match of federal funds, stimulate on average a return of at least nine dollars to one from other state, local, and private sources. The League submits written testimony to Congress in support of NEA funding every year, provides orchestras with customized tips for applying for an NEA grant, and complies the project descriptions for grants awarded to orchestras and projects related to the orchestra field. Complete lists of grant amounts and project descriptions for awards in all disciplines may be found on the NEA website in a state-by-state listing or a discipline/field listing. In addition, the NEA maintains an online grant search system which allows members of the public to search all of the NEA's grants since 2000 using a variety of attributes to customize search results. The NEA’s next application deadline is July 23, 2015 for Art Works, Part 2 (FY16 support). Members attending the League’s national Conference this May have the opportunity to meet one-on-one with an NEA music specialist to discuss the grant process. Appointments have already been filled at this point, but Conference attendees can check at the League’s Registration area for last minute availability due to possible on-site cancelations. Prospective applicants are always welcome to consult one-on-one with music specialists throughout the year. Share Your Story: Help the NEA Celebrate 50 Years of the Arts! This year is the 50th anniversary of the creation of the National Endowment for the Arts and the National Endowment for the Humanities. To mark the occasion, the NEA is welcoming stories from all corners of the country that tell how the arts have influenced your life or have inspired you in some way. Beginning September 29, the NEA will begin posting stories on its website. The NEA is currently accepting submissions of narratives, video, and/or audio. Washington, D.C. - Today Utah Symphony | Utah Opera President & CEO Melia Tourangeau testified before the U.S. House Subcommittee on the Interior, Environment, and Related Agencies to call for increased funding for the National Endowment for the Arts (NEA). Speaking on behalf of both the orchestra and opera fields, Ms. Tourangeau described the local impact of federal arts funding, saying, "The NEA grants competitively awarded to our organization have inspired and enabled us to create unique an enduring works, generate new community partnerships, and boost the civic vitality of our community." Today's hearing marks the beginning of Congressional consideration of the NEA's FY16 funding level. NEA grants to more than 116 orchestras in the most recent funding cycle support arts education for children and adults, expand public access to performances, preserve great classical works, and nurture the creative endeavors of contemporary classical musicians, composers, and conductors. A webcast of the hearing is available on the House Appropriations Committee website, and the written testimony is posted online as well. Congress settled on a massive FY15 spending package before adjourning for the year. In a $1.1 trillion deal that included gains and losses for a number of federal spending accounts, funding for the National Endowment for the Arts (NEA) and Arts in Education at the U.S. Department of Education (ED) held steady. The bill also included a number of policy provisions, including one related to multiemployer pension plans. Funding for the NEA will remain at the current level of $146 million through the end of FY15, September 30, 2014. The NEA has already announced the first batch of grants for FY15, and grant guidelines for FY16 are expected to be released at the end of this month. Grant support from the National Endowment for the Arts (NEA) will expand the capacity of 59 orchestras serving their communities in the coming year. The NEA's Art Works grants to orchestras encourage and increase access to music in communities throughout the country. In addition to providing direct funding, NEA awards, which require a minimum one-to-one match of federal funds, stimulate on average a return of at least nine dollars to one from other state, local, and private sources. The NEA's first round of FY15 Art Works grants include 42 direct awards to orchestras totaling $1,460,000, as well as numerous grants for related projects. Grantees will be presenting and offering new commissions, premieres, pre-concert lectures, workshops, and collaborations with various local organizations. Several grants will aid in training and development for emerging musicians and composers. The NEA also awarded $170,000 in FY15 Challenge America grants to 17 orchestras, which will strengthen their work in bringing music, educational programming, and lecture-demonstrations to underserved youth and adults. Supported projects include concerts and programming for geographically isolated communities, workshops and free lessons for students, and a variety of free programming and tickets for economically disadvantaged residents. Future FY15 grants will be announced for Art Works (Part Two) in the spring. Deadlines and guidelines for FY16 grant applications are expected in January. The Interior bill, which funds the National Endowment for the Arts, is one of several measures that will likely be rolled into a broader FY15 spending package in the coming weeks. This year the House and Senate committee recommendations for NEA funding were just $4 million apart, with the House supporting level funding and the Senate recommending an increase to $150 million. Because the current short-term spending deal only provides for government programs and services through December 11, 2014, Congress will need to act fast to avoid a government shutdown. NEA Budget Restored in House Committee! Following last week’s House Interior Appropriations Subcommittee recommendation to cut $8 million from the budget of the National Endowment for the Arts (NEA), this morning the full Appropriations Committee reversed the cut, restoring NEA funding in the bill to the current level of $146 million. Interior Subcommittee chairman Rep. Ken Calvert (R-CA) offered a manager’s amendment – a set of amendments that already have bipartisan support – which restored the FY15 recommendation for the NEA to matching last year’s allocation. Committee members Chellie Pingree (D-ME) and Nita Lowey (D-NY) also showed strong leadership in support of restoring NEA funding. The manager’s amendment was unanimously accepted, which demonstrates the strong bi-partisan support for the NEA among policymakers, and represents a major departure from last summer’s attempt to slash the NEA’s budget nearly in half. The Appropriations Committee has passed the overall bill, so the next step will be floor consideration by the full House of Representatives. Many thanks to orchestra advocates for speaking up and telling Congress how important NEA funding is to communities nationwide! The House Interior Subcommittee on Appropriations approved its funding bill yesterday, which includes an $8 million decrease in the FY15 budget for the National Endowment for the Arts (NEA). This proposed cut, while not the drastic 49% reduction that the Subcommittee recommended last year, would be the lowest budget for the NEA since FY08. Tell your elected officials how important NEA funding is to communities. Direct grants from the NEA to orchestras, as well as support to state arts agencies, enable public access to performances, preserve great classical works, bolster arts education for children and adults, and support the creative endeavors of contemporary classical musicians, composers, and conductors. The full House Appropriations committee will consider the bill on the morning of Tuesday, July 15, at which point amendments are likely to be offered on a range of budgetary items. If approved by the committee, the entire Interior funding bill will then advance to the full House for a vote. The House and Senate would each need to complete their respective bills before the fiscal year ends on September 30, so this is an opportune moment to speak up in support of public funding for the arts to your Representative and Senators. Urge Your Members of Congress to Support the NEA Today! Dr. Jane Chu was confirmed by the Senate last month as the 11th chairman of the National Endowment for the Arts (NEA). She served since 2006 as President and CEO of the Kauffman Center for the Performing Arts—the performance home of the Kansas City Ballet, Kansas City Symphony, and Lyric Opera of Kansas City. Dr. Chu made her first public appearance as NEA Chairman at the June 27th convening of the National Council on the Arts in Washington, D.C., and describes in an NEA podcast how the study of music, visual art, philanthropy, and business strategy has shaped her approach to her new role. Grants awarded to orchestras by the NEA provide critical funding for programs that increase public access to music in communities nationwide, preserve great classical works, support arts education for children and adults, and nurture the creative endeavors of contemporary classical musicians, composers, and conductors. Orchestras interested in applying for the 2nd round of Art Works grant funding should take note of the earlier deadline this year of July 24, 2014.Grant tips for your application are available on the League’s website. The first step in the confirmation process of Dr. Jane Chu as the next chair of the National Endowment for the Arts (NEA) was cleared today, with the Senate Committee on Health, Education, Labor, and Pensions voting to approve the President’s nomination. The next step is floor consideration by the full Senate, to be scheduled by majority leader Sen. Harry Reid (D-NV). Dr. Chu’s confirmation is eagerly anticipated due to her deep knowledge and experience in community engagement and revitalization through the arts. Her approval would fill a vacancy that has lasted for more than one year. Operating under an interim chair, the agency has continued to disburse grants, release impactful research, and most recently, move to a new office location. The League has been a long-time advocate for increased funding for the NEA, submitting written testimony each year, and regularly communicates grant opportunities and key updates to orchestras throughout the year. For any organization that received an NEA grant this year, we encourage you to reach out to your Members of Congress to let them know how the agency’s support is strengthening your community at home! Orchestras in 51 communities will offer a variety of engaging, educational and innovative programming, as well as bring music to underserved regions and populations thanks to $1,237,500 in Art Works, Part 2 grants from the National Endowment for the Arts (NEA). This essential support will enable orchestras to present live music experiences, make recordings and broadcasts, and provide valuable music education programs. NEA funding increases access to music in communities of all sizes nationwide, and in addition to providing direct support for local projects, the award of an NEA grant also enhances the ability of grantees to pursue support from other sources like private foundations, corporations, and individual contributors. The NEA requires at least a one-to-one match of federal funds from all grant recipients, and on average, each NEA grantee far exceeds that requirement and generates at least nine dollars for every one dollar the NEA gives. The NEA’s next FY15 Application deadlines are May 8, 2014 for Challenge America Fast-Track and July 24, 2014 for Art Works, Part 2. Members attending the League’s national Conference this June may schedule a one-on-one appointment to discuss the NEA grant process with an NEA music specialist. Both Court Burns and Anya Nykyforiak will be at the League’s Conference in Seattle this year, so please contact Najean Lee in the League’s DC office to schedule your free appointment. More than 60 orchestras will serve their communities, and regions beyond, in innovative ways with support from the National Endowment for the Arts (NEA). The NEA’s Art Works grants to orchestras encourage and increase access to music in communities throughout the country. In addition to providing direct funding, NEA awards, which require a minimum one-to-one match of federal funds, stimulate on average a return of at least seven dollars to one from other state, local, and private sources. The NEA’s first round of FY14 Art Works grants include 46 awards totaling $1,450,000 directly to orchestras, as well as numerous grants supporting related efforts. These projects include new commissions, premieres, residencies, instrument training programs for young musicians, pre-concert lectures, workshops, and collaborations with cultural organizations, social service organizations, and schools. Several grants will aid in the production of programs that juxtapose traditional and contemporary works, mix artistic genres, and draw inspiration from various cultural experiences. The NEA also awarded $190,000 in FY14 Challenge America Fast-Track grants to 19 orchestras, which will strengthen their work in bringing music, educational programming, and lecture-demonstrations to underserved youth and adults. Supported projects include concerts and programming for students and adults with disabilities, senior citizens, geographically isolated communities. The League has compiled the project descriptions for grants to orchestras and grants related to the orchestra field. Complete lists of grant amounts and project descriptions for awards in all disciplines may be found on the NEA website. National Endowment for the Arts (NEA): For all intent and purpose, the agency will be considered closed, with approximately half a dozen staff approved to hold down the fort. All other employees will be furloughed and most contractors must stop working while a shutdown continues. In most cases, current grantees can continue to expend funds they have already received but should not expect to receive payments during a shutdown. In the very unlikely event that a specific grantee's work must be disrupted, grantees will be notified and given specific guidance by the NEA’s Grants Office. For more information, see the plan published by the NEA. Your advocacy on this issue is greatly appreciated! Thanks to the many orchestra advocates who have written to their elected officials in support of protecting the NEA. If youhave not yet spoken up, now is the time to reach out and tell Congress about the public value of the arts. With Members at home for the next five weeks, use this opportunity to reinforce your message by inviting them to witness your orchestra at work in your local community! Speak up now to tell your elected officials how important NEA funding is to communities, and defend the public value of the arts. NEA direct grants to orchestras and NEA support to state arts agencies provide public access to performances, preserve great classical works, support arts education for children and adults, and nurture the creative endeavors of contemporary classical musicians, composers, and conductors. What’s Next: With members of Congress on both sides of the aisle unhappy with the broad Interior funding package, the bill may undergo significant changes when considered by the full House Appropriations committee as early as next week. From there, further action on the entire Interior bill is highly unpredictable. Time is quickly running out for the House and Senate to complete appropriations bills before the fiscal year ends on September 30. Even if the Interior bill doesn’t ultimately see its way to completion, both the House and Senate will soon begin negotiating on all final FY14 funding decisions. This is a critical moment to speak up in support of public funding for the arts! Go on record urging your members of Congress to support the NEA. NEA Funding: The President's FY14 budget proposes $154.466 million for the National Endowment for the Arts (NEA), which would nearly restore the agency to FY11 funding levels. Congressional action on the budget process will begin in the coming weeks, and the League of American Orchestras will submit testimony to both the House and Senate explaining the public value of grants to orchestras. Funding debates in D.C. promise to be intense, and orchestras are joining other arts advocates in asking Congress to provide $155 million in NEA funding in FY14. If your orchestra is an NEA grant applicant, please stay tuned for further details. There is one more major round of NEA grant announcements anticipated this coming spring, and the agency is required to make reductions in core grant-making funds as a result of the sequester. The 5% cut to the NEA’s overall FY13 budget also means advocacy to protect and restore funding in the next budget year – FY14 – is particularly important. On Wednesday, January 30, the National Endowment for the Arts (NEA) will present a webinar for Art Works music applicants. The webinar will provide an overview of the Art Works funding category, discipline-specific information about how prepare a strong application, and answers to your questions from NEA staff. To join the webinar, which will be held from 1-2pm EST on January 30, please go to this page. Orchestras may also be interested in joining a webinar for arts education applicants that will be held on February 12 from 1-2pm. All webinars will be archived two days after they are conducted. Please mark your calendars with the newly announced application deadlines for FY14 Grant for Arts Projects, and be sure to download the League’s updated guidance specific to orchestra applicants from our Tips for your application page. Orchestras in 42 communities will support education and training of young musicians, artist residencies, commissions and premieres of new works, free concerts, community engagement programming, and the celebration of regional and indigenous culture thanks to $1,450,000 in funding from the National Endowment for the Arts (NEA). The NEA’s first round of Art Works grants, announced November 27th, supports projects that encourage and increase access to music in communities nationwide. On December 4th, the NEA also announced that Challenge America grants totaling $240,000 will support 24 orchestra projects that will extend the reach of music, performance discussions, workshops, and master classes to populations whose arts engagement abilities are otherwise limited due to geography, economics, or disability. In addition to providing direct funding, NEA awards, which require a minimum one-to-one match of federal funds, stimulate on average a return of at least seven dollars to one from other state, local, and private sources. Future FY13 grants will be announced for Art Works (Part Two) in 2013. Tell Congress to Protect the NEA! Washington, D.C. - The Congressional funding process for the National Endowment for the Arts (NEA) has begun on a sour note. Yesterday, the U.S. House Interior Appropriations Subcommittee voted in favor of a proposal to reduce funding for the NEA from its current funding level of $146.3 million to an FY13 allocation of $132 million. The NEA's budget has already been cut in the past two budget cycles. The further reduction proposed by the Interior committee will threaten the NEA's capacity to make grants in communities nationwide. It is extremely important that all members of Congress hear from constituents across the country about the NEA's work to broaden access to artistic excellence, foster lifelong learning, and conduct research of national significance. NEA funding increases the capacity of orchestras to provide public access to performances, preserve great classical works, support arts education for children and adults, and nurture the creative endeavors of contemporary classical musicians, composers, and conductors. Congress will continue the budget process throughout this summer, and likely into the fall - every vote will count, so ensure today that your Representative and Senators know the value of NEA funding for your community! Washington, D.C. – Orchestras will serve communities through a variety of educational programs for children and adults, free concerts, tours to underserved regions and populations, radio broadcasts, residencies, youth mentorships, and community engagement activities thanks to 40 grants totaling $1,035,500 in essential Art Works support from the National Endowment for the Arts (NEA). NEA funding encourages and increases access to music in communities nationwide. In addition to providing direct support for local projects, NEA funding also spurs critical giving from other sources like private foundations, corporations, and individual contributors. The NEA requires at least a one-to-one match of federal funds from all grant recipients and on average, each NEA grant generates at least eight dollars from other state, local, and private sources, magnifying the impact of the federal investment..
Washington, D.C. – The House of Representatives is scheduled to vote tomorrow on a non-binding budget resolution, signaling the beginning of the Congressional budgetary process for the 2013 fiscal year. The resolution that is up for vote includes inflammatory language about cultural agencies such the National Endowment for the Arts (NEA) and the National Endowment for the Humanities (NEH), asserting that the activities funded by these agencies "are generally enjoyed by people of higher income levels, making them a wealth transfer from poorer to wealthier citizens." It is important to begin communicating with your Members of Congress in both the House and Senate to remind them just how effectively NEA grants enable organizations to reach otherwise underserved communities. Let your Members know, as well, how critical a role an NEA grant plays in the ability to raise additional funding. Although budget resolutions are non-binding, which means the ultimate decisions about the federal budget are made by the Appropriations Committee, the statements in the House Budget Resolution regarding cultural agencies set a negative benchmark for Congressional priorities moving forward. The League, together with the Performing Arts Alliance, urges arts advocates to stay alert and engaged as the appropriations process transpires so that all Representatives and Senators remain well informed about their orchestras at home and the value of federal support for the arts. In addition to advocating for federal support for the National Endowment for the Arts (NEA), the League of American Orchestras compiles and reports the agency’s yearly grants to orchestras, advises orchestras of upcoming grant opportunities, and provides unique tips for orchestras applying for NEA support. The NEA recently posted its FY13 Grants for Arts Projects guidelines. To assist orchestras, specifically, with the application process, the League attends the public sessions of NEA review panels, attends the National Council on the Arts public meetings, and confers with NEA program staff to outline helpful tips for preparing your application. Our Tips for NEA Grant Applications (.pdf) is updated each year to compile the links you’ll need, gather expert advice from panelists and program staff, and call special attention to important changes all applicants should know. As first reported in November, the NEA has confirmed that it will no longer be accepting consortium applications for FY13 grants. In the past, an organization could apply up to two times - once on its own, and a second time in partnership with other organizations. The new single-application rule means that applicants must choose to apply either for an Art Works or Challenge America grant, with the additional important change that Arts in Media (formerly known as the Arts on Radio and Television) is now incorporated into the Art Works: Media Arts category and therefore also subject to the single-application rule. Another important change is that work samples can only be submitted electronically from now on. Detailed information and a breakdown of the schedule for submitting work samples via the new NEA GrantsOnline™ System (NEA-GO) are contained within the League’s Tips resource. Art Works: Arts Education grantees should know that they will need to submit their assessment tools in the final report, and these tools may be shared publically. Lastly, selected grantees involved in the presentation of art will be required to conduct surveys of audience members to gauge the nature and extent of audience response to these art experiences. These selected grantees will receive materials, technical assistance, and up to $1,000 in nonmatching supplemental funding from the NEA. Find more details, contact information for NEA program specialists, and valuable advice from NEA panelists in our customized Tips for orchestra applicants! Late last week, the President signed a consolidated bill to finalize FY12 federal funding, including $145.979 million for the National Endowment for the Arts (NEA) and $24.593 million for the Arts in Education (AIE) program at the U.S. Department of Education. After a rollercoaster year, the FY12 NEA budget suffered a decrease of $8.745 million compared to last year’s allocation. The House and Senate proposed budgets ranging from $135 million to $155 million, ultimately compromising to reach the same amount originally requested by the President, a decrease for the agency to a level of $145.979 million. In anticipation of a decrease this year, the NEA, which is halfway through its FY12 grant cycle, has reduced the total amount of grant disbursement, and further changes for FY13 grants and beyond are expected to be announced shortly. Visit our NEA tips for orchestra applications for more information. The National Endowment for the Arts (NEA) recently announced its first round of FY12 grants to organizations in the Art Works category, and on December 6, the NEA announced the grant recipients in the category of Challenge America Fast-Track Review. Funding from the NEA provides vital support to encourage and increase access to music in communities nationwide. Challenge America Fast-Track grants of $10,000 each will support orchestras in sixteen communities as they provide performances, open rehearsals, high school workshops, master classes, special student presentations, and work with local community partners to serve public schools and assisted-living communities. Challenge America grants help orchestras to bring the experience of the arts to underserved populations limited by geography, demographics, economics, or disability. The remaining FY12 grants for Art Works (Part Two) will be announced in the spring of 2012. The NEA has set the deadlines for FY13 Grants for Arts Projects, the Endowment's major support category for organizations. As a reminder, the Access to Artistic Excellence and Learning in the Arts for Children and Youth categories have been replaced with the funding category called Art Works, with sub-categories of Creation, Engagement, Livability, and Learning. In January, the NEA will release guidelines for applying for FY13 Grants and the League will provide updated guidance specific to orchestras on our Tips for your application page. Orchestras may also be interested in exploring opportunities for Our Town funding, which supports creative placemaking projects in which communities collaborate with their arts and design organizations and artists to enhance community vibrancy in a variety of ways. Grants will range from $25,000 to $150,000, with applications due Thursday, March 1, 2012. Please visit the NEA website for complete guidelines about Our Town. Due to budgetary constraints, the National Endowment for the Arts (NEA) will not be awarding consortium grants beginning with the FY13 application process. This means that applicants planning grant submissions to the NEA for FY13 should prepare with the understanding that they can make one and only one application from the NEA: either in the Art Works or Challenge America categories. Previously, organizations could apply up to two times - once on their own, and a second time in partnership with other organizations. The FY13 grant guidelines will be available in January 2012. Another change that will appear in the guidelines will be the incorporation of the Arts in Media into the Art Works category for Media Arts. The types of projects supported in the past in both categories will continue to be offered under Art Works. Media applications will also be subject to the one-application-per-year rule that applies to all applicants. The sole exception to the one-application limit will be for parent organizations that have separately identifiable and independent components and are submitting a second application in connection with that component organization (i.e., an adult orchestra filing on behalf of an affiliated youth orchestra). Guidance on FY13 grants should be available in January, but to learn more about the current FY12 independent component policy for parent (and related) organizations, please visit the NEA's website. As soon as the FY13 grant guidelines become available, the League will keep you apprised and update its webpage offering tips for preparing an NEA grant application. Bipartisan Effort Protects NEA from Further Cuts! Washington, D.C. - Bipartisanship in Washington? Yes! Just yesterday, House Republicans and Democracts acted together to support funding for the arts, defeating an amendment that would have further reduced NEA funding. An amendment offered by Rep. Tim Walberg (R-MI) would have decreased FY12 NEA funding to $124.4 million, and was defeated yesterday by a vote of 181-240, with 55 Republicans voting in opposition to the amendment. Just five months ago, when Rep. Walberg offered an amendment to decrease FY11 NEA funding to $124.4 million, the amendment passed in the House by a vote of 217-209. The ultimate FY11 bill approved by Congress contained $155 million for the NEA. Several key bipartisan developments combined to influence the outcome of yesterday's vote. Thanks to YOUR ADVOCACY, extraordinary leadership by the Congressional Arts Caucus Co-chairs Rep. Louise Slaughter (D-NY) and Todd Platts (R-PA), compelling remarks in support of the NEA on the House floor by Interior Appropriations Committee Chairman Mike Simpson (R-ID), and a White House veto threat opposing the already-lowered funding level, the NEA was spared further cuts yesterday. 1. Check our House Voting Record to see how your Member of Congress voted, and send a follow-up message to your Representative. We've created a voting record that charts the FY11 and FY12 votes side-by-side so that you can see which members changed their votes to support the arts. It is important that your elected officials know you have paid attention to their vote. 2. Visit with your members of Congress during the upcoming recess , and ask them to support NEA funding. The House FY12 spending bill, unamended, already included a $20 million cut to NEA funding, bringing total funding down to $135 million. The FY12 funding bill will be taken up by the Senate after House consideration is complete. The League will keep you posted on upcoming Senate action, but please start your advocacy now. Pivotal NEA Vote - Contact Congress! Washington, DC - As early as next Monday, the full U.S. House of Representatives will vote on FY12 funding for the National Endowment for the Arts. The House Appropriations Committee has proposed a $20 million reduction in support for the arts, a 13% reduction from the current funding level of $155 million. This is nearly twice the rate of overall spending cuts for other federal programs in the bill. The NEA suffered a $12.5 million decrease last year, the cut currently proposed by the House is disproportionate to overall spending reductions, and amendments to even further reduce NEA spending may be offered when this bill comes to a vote. Use the link to our e-advocacy tool below to tell your Representative to protect the NEA from further spending cuts. The League's advocacy campaign includes a sample letter to Congress and talking points that illustrate the unique value of NEA support in communities across the country. Urge the House to Protect the NEA! Washington, DC - Today, the U.S. House Interior Appropriations Subcommittee voted to cut National Endowment for the Arts (NEA) funding by $20 million for FY12 from the current funding level of $155 million. Last year the NEA suffered a $12.5 million decrease. Today’s proposal more than doubles the $9 million reduction recommended by President Obama this year. The Subcommittee’s nearly 13% cut is also disproportionate to the 7% cut to the overall spending levels in the entire Interior bill. The full House Appropriations Committee is expected to vote on the FY12 Interior Appropriations bill as early as next Tuesday. In advance, it is extremely important that members of the Appropriations Committee hear from constituents across the country supporting funding for the NEA. If your Representative serves on the House Appropriations Committee (see chart below), it is particularly critical that you ACT TODAY and ask your Representative to protect funding for the NEA. You can verify who your Representative is here. Even if your Representative is not on the committee, please consider sending a letter of support for the NEA. Throughout this summer, and into the fall, Congress will continue the budget process and every vote will count. Be sure your Representative knows the value of NEA funding for your community! Washington, D.C.- Orchestras will implement 38 projects that will provide educational and community activities, music lessons and workshops, residency programs, professional development for teachers and school administrators, tours, concerts, festivals, recording projects, and premieres of new works with the support of $1,265,500 in grants recently awarded by the National Endowment for the Arts (NEA). The second round of FY11 NEA grant awards was announced on May 17 in the major funding categories of Access to Artistic Excellence Part Two and Learning in the Arts for Children and Youth. Washington, D.C. - Your continued advocacy is needed in support of the National Endowment for the Arts (NEA). The House FY11 spending bill already included a $22.5 million cut to NEA funding; yesterday the House approved an amendment taking a second bite out of the NEA's budget for a total decrease of $43.1 million, which represents more than a 25% cut from current funding. * The amendment, offered by Rep. Tim Walberg (R-MI), to decrease NEA funding by $20.6 million, was approved by a vote of 217-209. * Two amendments, filed by Rep. Scott Garrett (R-NJ) and Rep. Connie Mack (R-FL) to completely eliminate NEA funding, were not ultimately offered on the House floor. 1. Check our House Voting Record to see how your Member of Congress voted, and send a follow-up message to your Representative. It is important that your elected officials know you have paid attention to their vote, and we will need everyone's support when the House soon takes up FY12 spending decisions. 2. Contact your U.S. Senators and ask them to restore NEA and Arts in Education funding. The FY11 funding bill will be taken up shortly after the Senate returns from the President's Day recess. We are calling on the Senate to restore funding to the NEA and reinstate Arts in Education funding at the U.S. Department of Education. The League will keep you posted on upcoming Senate action, but please start your advocacy now. THANK YOU FOR YOUR CONTINUED ADVOCACY: Orchestras and their supporters sent more than 1,200 messages to the U.S. House of Representatives in support of arts funding, joining with countless fellow arts advocates across the country to describe how the arts strengthen the economy and improve civic life. Two amendments to eliminate the NEA were dropped altogether. Thank you for taking time to connect with your Representative and keep up the momentum as the U.S. Senate acts next! URGENT! Oppose Amendments to Slash NEA Funding! Oppose the amendment offered by Rep. Tim Walberg (R-MI) that would decrease NEA funding by an additional $20.6 million, for a total NEA cut of $43.1 million. Oppose the amendment offered by Rep. Scott Garrett (R-NJ) that would eliminate FY11 NEA funding altogether. Thanks to all who have already weighed in with Congress in response to the recent League alerts. We need you to continue speaking up! For those of you who have not yet acted, please make your voice heard now. The League will keep you informed of the outcome of these votes and will let you know how you can help with the next step - consideration by the U.S. Senate. Speak Up in Support of the NEA! Washington, D.C. - As the U.S. House of Representatives votes on final FY11 spending bills early next week, amendments will likely be offered to substantially decrease and/or eliminate funding for the National Endowment for the Arts. The House Appropriations Committee is discussing a minimum $12.2 million decrease in NEA funding, as part of widespread cuts to discretionary spending. This would reduce the current NEA operating budget to $155.3 million. It is imperative that arts advocates speak up in opposition to further reductions in NEA funding levels when the bill leaves committee and comes up for a vote on the House floor. The FY11 NEA grantmaking process is mid-stream, so cuts would immediately impact the grantmaking process. Tell your Representative exactly what is at stake if this important funding were to be lost! CLICK HERE TO PERSONALIZE AND SEND A MESSAGE TO YOUR MEMBER OF CONGRESS NOW! The League will keep you up to date as NEA FY11 funding moves through the House and onto the Senate for full consideration. Next up: the President's FY12 budget will be released on Monday, which means your advocacy will be needed to influence the outcome of not one, but two years of NEA funding. Thank you! Washington, D.C. - The latest grant application guidelines released today by the National Endowment for the Arts (NEA) include significant changes from prior years. For FY12, the Access to Artistic Excellence and Learning in the Arts for Children and Youth categories have been replaced with a new funding category called Art Works, with the sub-categories of Creation, Engagement, Livability, and Learning. The NEA promotes creativity and public access to the arts in communities across the country through direct grants to arts organizations, state funding partnerships, and national initiatives. NEA grants awarded to orchestras provide vital funding for projects that support and increase access to music in communities nationwide. Understanding the new NEA grant guidelines is essential to preparing a successful application. To assist orchestras, the League is hosting a live webinar with experts from the NEA. Join NEA Music and Opera Director Wayne Brown and Arts Education Director Sarah Cunningham as they walk orchestras through the guideline changes, and learn everything you need to know about the new application requirements and reporting procedures. The free webinar will take place January 24 at 1pm EST. As your orchestra considers the new grant structure and prepares for upcoming deadlines, view the NEA's helpful online overview explaining the changes to the grant categories. The NEA has posted a helpful overview of the changes in store for FY12. Take a look and consider what these changes might mean for your orchestra's grant opportunities. On December 8, 2010 President Obama announced his intent to nominate Aaron Dworkin to be appointed as a Member of the National Council on the Arts, an advisory body to the National Endowment for the Arts. Mr. Dworkin, who is President and Founder of the Sphinx Organization, was a member of the Obama National Arts Policy Committee and was named a MacArthur fellow in 2005. Grants awarded to orchestras by the National Endowment for the Arts (NEA) provide vital funding support for projects that support and increase access to music in communities nationwide. The first FY11 NEA grant awards were announced on November 23 through the Challenge America: Fast Track Review and Access to Artistic Excellence grant categories. In addition to supporting local projects directly, NEA funding stimulates crucial giving from other sources like private foundations, corporations, and individual contributors. Orchestras in thirteen communities will provide performances, pre-concert lectures, workshops, enrichment programs, and master classes with the support of $10,000 grants recently awarded by the National Endowment for the Arts (NEA). Challenge America grants will help orchestras bring the experience of the arts to underserved populations limited by geography, demographics, economics, or disability. Access to Artistic Excellence (Part One) grants totaling $1,560,000 will allow 37 distinct orchestra projects to provide educational activities, concerts, festivals, master classes, radio broadcasts, orchestra tours, professional development, and residencies in communities across the country. Future FY11 grants will be announced in the categories of Learning in the Arts for Children & Youth and Access to Artistic Excellence Part Two. The NEA will announce deadlines for FY12 Grants for Arts Projects, the Endowment's major support category for organizations in early-mid January. The Access to Artistic Excellence and Learning in the Arts for Children and Youth categories have been replaced with a new funding category called Art Works, with the sub categories of Creation, Engagement, Livability, and Learning. The guidelines for preparing an FY12 grant application to the National Endowment for the Arts (NEA) will look significantly different when released this coming January. Last week, the NEA provided highlights of some of the changes applicants can expect. All types of projects supported in the past under Access to Artistic Excellence will continue to be eligible under the Art Works framework. Two additional eligibility changes will apply: Any applicant applying for an official Consortium project in Art Works must apply for an “innovative” project. If a grantee has received a Challenge America Fast-Track grant for the past three consecutive years, it is not eligible to apply to the Fast-Track category this year but may apply to other NEA funding opportunities including the new Art Works categories. The League has posted a more detailed description of changes to the FY12 NEA grant process and will keep you posted regarding further developments! The National Endowment for the Arts' (NEA) FY11 Grants for Arts Projects guidelines are now available on the NEA website. To assist orchestras with the application process, the League has again outlined helpful tips for preparing your application, including new information about the Grants.gov process. Orchestras may also contact an NEA specialist to talk through the application. Grants awarded to orchestras by the National Endowment for the Arts (NEA) provide critical funding for projects that increase access to music in communities nationwide. The first FY10 NEA grant awards were announced on December 8 through the Challenge America: Reaching Every Community Fast Track Review and Access to Artistic Excellence grant categories. NEA funding both directly supports local projects and also spurs critical giving from other sources like private foundations, corporations, and individual contributors. Orchestras in 14 communities will provide performances, workshops, festivals and master classes with the support of $10,000 grants recently awarded by the National Endowment for the Arts (NEA). Challenge America grants will help orchestras bring the experience of the arts to underserved populations limited by geography, demographics, economics, or disability. Access to Artistic Excellence (Part One) grants totaling $1,471,500 will allow 52 distinct orchestra projects to provide educational activities, concerts, premieres, festivals, podcasts, radio broadcasts, orchestra tours, professional development, and residencies in communities across the country. Future FY10 grants will be announced in the categories of Learning in the Arts for Children & Youth and Access to Artistic Excellence Part Two. Support an Increase for the NEA! Washington, D.C. - You are receiving this targeted email because your orchestra is located in the state of a member of Congress who is influential in determining the funding allocation for the National Endowment for the Arts (NEA). Please share this message with others stakeholders in your orchestra. Congress is nearing its final decision on FY10 funding for the National Endowment for the Arts! The House has recommended a $15 million increase for the NEA, while the Senate endorses $6.3 million over current funding. As the House and Senate meet to determine the final amount allocated to the NEA, please communicate to your members of Congress about the importance and value of NEA funding, and request approval of the House-supported funding level of $170 million for the NEA in FY10. Orchestras in 50 communities will provide educational activities, workshops, master classes, and concerts with the support of $1,411,500 in grants recently awarded by the National Endowment for the Arts (NEA). The second round of FY09 NEA grant awards was announced on April 30 in the major funding categories of Access to Artistic Excellence Part Two and Learning in the Arts for Children and Youth. In addition to these larger grant categories, funding through Save America's Treasures will enable the Rosenthal Archives Collection to advance preservation and conservation efforts documenting the history of the Chicago Symphony Orchestra, and Arts on Radio and Television grants will support radio broadcasts by the Chicago Symphony Orchestra, the New York Philharmonic, and the San Francisco Symphony. Orchestras that have received a National Endowment for the Arts (NEA) grant within the past four years may be eligible to apply for funding from the NEA to help stabilize local economies. The NEA has just announced grant guidelines and an application deadline of April 2, 2009 for arts organizations applying for NEA funding provided in the American Recovery and Reinvestment Act of 2009. These critical funds will be available as non-matching one-time grants of $25,000 or $50,000 for projects that focus on the preservation of jobs in the arts. The National Endowment for the Arts’ (NEA) FY10 Grants for Arts Projects guidelines are now available on the NEA website. To assist orchestras with the application process, the League outlines helpful tips for preparing your application, including an overview of guideline changes. Orchestras may also contact an NEA specialist to talk through the application. With the support of grants awarded by the National Endowment for the Arts (NEA), orchestras will provide performances, workshops, festivals, and master classes to their communities. Challenge America Fast-Track Review grants to orchestras totaling $140,000 and Access to Artistic Excellence, Part One grants to orchestras totaling $1,430,500 were awarded on December 4. The League has compiled the project descriptions for grants to orchestras and grants related to the orchestra field. On June 11, the House Interior Appropriations Subcommittee recommended a $15.3 million increase in funding for the National Endowment for the Arts (NEA) in FY09. If approved by the full House and Senate, NEA funding would total $160 million. However, Congress is deadlocked over how to move ahead with funding for nearly all federal programs. Spending will likely be set at last year's level until a new Congress and President arrive in Washington next year. Two opportunities remain for orchestras to apply for FY09 NEA Grants. The deadline for Part Two of the Access to Artistic Excellence program is August 11, 2008. Applications to the Arts on Radio and Television category are due September 5, 2008. The National Endowment for the Arts' (NEA) FY09 Grants for Arts Projects guidelines are now available on the NEA website. To assist orchestras with the application process, the League attends the public sessions of NEA review panels throughout the year and outlines helpful tips for preparing your application, including an overview of guideline changes. Orchestras may also contact an NEA specialist to talk through the application. The NEA funding increase was included in a catch-all spending bill that combined 11 annual federal funding measures. Congressional Arts Caucus co-chairs Louise Slaughter (D-NY) and Chris Shays (R-CT) rallied House colleagues in support of the NEA, and Interior Appropriations Committee Chairman Norm Dicks (D-WA) championed NEA funding as a priority issue. Today's advancement of NEA funds reflects years of advocacy since the agency's budget was severely cut in 1995. Orchestras will continue to seek full restoration of NEA funding in 2008. Stay tuned! With the support of grants awarded by the National Endowment for the Arts (NEA), orchestras will provide performances, workshops, master classes, and various community engagement programs to their communities. Challenge America Fast Track Review grants to orchestras totaling $110,000 were awarded on November 15, and Access to Artistic Excellence, Part One grants to orchestras totaling $1,502,000 were awarded on December 4. The League has compiled the project descriptions for grants to orchestras and grants related to the orchestra field. A major restoration of National Endowment for the Arts (NEA) funding moved one step closer to enactment yesterday as the House approved a $35 million increase—the largest single increase in NEA history. Thank you for letting Congress know the value of NEA support for orchestras and the communities they serve. Advocacy efforts by orchestras and the broader arts community contributed to this major advancement in NEA funding, and further advocacy will be crucial as the NEA's bill undergoes final consideration by the full Senate and key congressional leaders. Yesterday, the two highest-ranking members of the House subcommittee responsible for funding the National Endowment for the Arts (NEA) heard testimony from Phoenix Symphony violist Karen Bea, who said, "It is time to increase federal support for the vitality of the arts in communities nationwide. The NEA has never fully recovered from a 40% budget cut in 1996." In a hearing called by the House Interior Appropriations subcommittee, Bea was one of just two public witnesses invited to testify regarding federal arts funding. Actress Kerry Washington also provided eloquent testimony describing how the nonprofit performing arts led her to a successful commercial career. Bea’s testimony highlighted the public value of NEA funding, specifically describing the Phoenix Symphony’s NEA-supported One Nation project, a partnership with the Salt River Pima-Maricopa Indian Community. Chairman Norm Dicks (D-WA) and Ranking Member Todd Tiahrt (R-KS), complemented the testimony. Chairman Dicks indicated his ongoing support for the NEA while Rep. Tiahrt recognized the value of NEA grants and his appreciation for a recent Kansas residency by the National Symphony Orchestra.